FERDINAND tells the story of a giant bull with a big heart. After being mistaken for a dangerous beast, he is captured and torn from his home. Determined to return to his family, he rallies a misfit team on the ultimate adventure. Set in Spain, Ferdinand proves you can’t judge a bull by its cover. 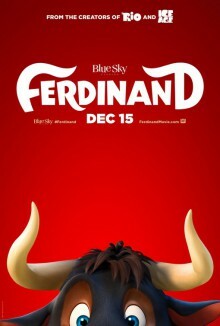 From Blue Sky Studios and Carlos Saldanha, the director of “Rio” and inspired by the beloved book “The Story of Ferdinand” by Munro Leaf and Robert Lawson, “Ferdinand” is a heartwarming animated comedy adventure with an all-star cast that includes John Cena, Kate McKinnon, Gina Rodriguez, Anthony Anderson and many more. Join LatinoScoop at an exclusive advance screening of FERDINAND in select locations below. Click on the link below for your city and enter the code. If you download a screening pass and aren’t able to use it, please share it with someone who can attend. There are limited number of passes available for each location. Screening passes are available on a first-come, first-serve basis. Additional passes will not be added once they are all redeemed. All advance screenings will take place on Saturday, December 9. Anyone downloading a screening pass is advised to arrive early to secure seating. The theater is intentionally overbooked by the studio to ensure a full house. Plan accordingly to arrive with enough time.